ATHERTON, Michelle (2014). Absorbing red photons : work in progress presentation. 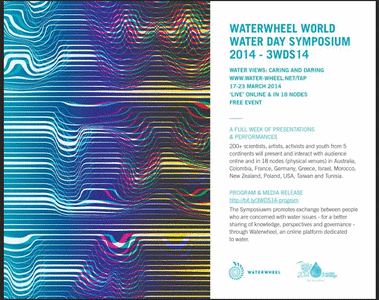 In: Waterwheel World Water Day Symposium 2014 – 3WDS14, Online Symposium across 30 countries from 5 continents, 17-23 March 2015. Absorbing red photons (working title) is currently a work-in-progress video installation. It continues a trajectory in my work that uses cultural phenomenon, often types of transportation, as a starting point to discuss current structures, systems and indeterminate preoccupations. The artwork takes as its starting point a tourist trip in a submersible that travels to a depth of 2,000ft below sea level of the coast of Roatan, Honduras. The aim of the artwork is to explore what might be revealed through this brief act of submersion in a place of perpetual darkness. From 17 to 23 March, 200+ scientists, artists, activists and youth representing 30 countries from 5 continents presented their latest work, and interact with audience online and in 18 nodes (physical venues). Program http://bit.ly/3WDS14-program Media Release http://bit.ly/3WDS14-mediarelease Papers, performances, workshops & discussions The Symposium promotes exchange between people who are concerned with water issues - for a better sharing of knowledge, perspectives and governance - through Waterwheel, an online platform dedicated to water. The program composed of 42 sessions, caters for all time zones, and focuses on art, science and activism. It explores questions about how we are living, and will continue to live, with water and its contrasts. Demands for new perceptions and approaches to water management, urban planning, and cooperation, renewed respect for water as a vital resource and shared heritage are highlighted through trans-disciplinary approaches. Discussions between presenters and audience online and onsite will follow every session. The symposium is free. Everyone is welcome to participate. 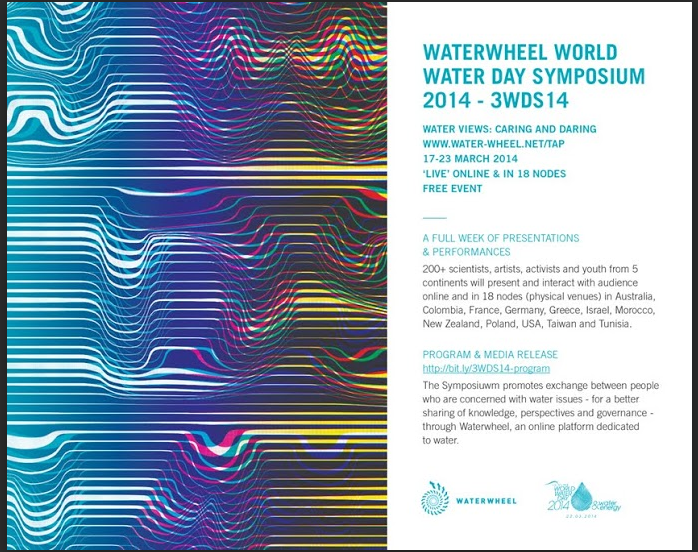 To view the Symposium, open your browser with the latest Flash player plu­gin, go to http://water-wheel.net/tap & click the top-most Symposium link.